I’ve created this card using the sketch from the Viva la Verve April week four challenge. The card base is a standard A2 (4.25″ x 5.5″). Over top of that is a piece of Melissa Frances designer paper that’s been distressed and inked. Next comes some chevrons that have been dry embossed for a little texture. 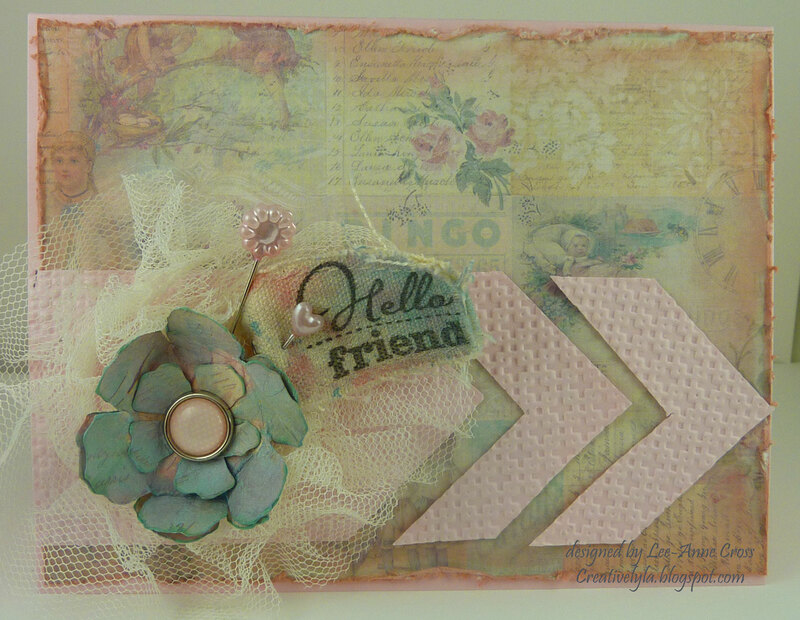 The flower has been made with a coordinating designer paper using the Tim Holtz Tattered Florals die. It’s been scrunched, inked, and sprayed with glimmer must (which sadly doesn’t show up in my picture). Behind it is some tulle ribbon, a couple of pins and a canvas tag. The canvas tag was also inked and sprayed with glimmer mist and then stamped with the sentiment.